Happy Monday everyone.. It's time for the April Release from Newton's Nook and we are starting off with a peek at the new set Beautiful Plumage and it's coordinating die set. Be sure to join us all week as we reveal the new Release and all the New Products that will be available in the store on Friday April 14th. I used some Distress Oxide Inks to create a Fun background and color in the image. I started by creating the background on a piece of watercolor paper and then Once it was dry I trimmed off the edge and adhered it to a Black card base. Then I stamped the sentiment onto a strip of White card stock and stamped it in Cracked Pistachio, Wilted Violet and Broken China. These are the same colors I used for the background as well. I stamped the peacock image onto some watercolor paper with VersaFine ink and heat embossed it in Clear. Then I wet the areas of the image and dropped the color into it and let it spread around on it's own. Once it was dry I rubbed off any excess that was over the embossed areas. I used the coordinating dies to cut the image out and I adhered it to the card front with some foam adhesive. For a little sparkle I added some Sparkling Clear Sequins. You are going to love this Release! Would you like to win the “Beautiful Plumage” Stamp Set? Comment on the NND blog and Design Team blogs (see list below)! The winner will be chosen at random from the collective reveal posts. Make sure to check out each of their blogs and comment for your chance to win. You will not know which blog has been chosen so the more you comment on the better your chances are of winning! You have until Thursday April 13th at 9pm CST to comment -- winners will be announced on the blog post on Friday, April 14th. 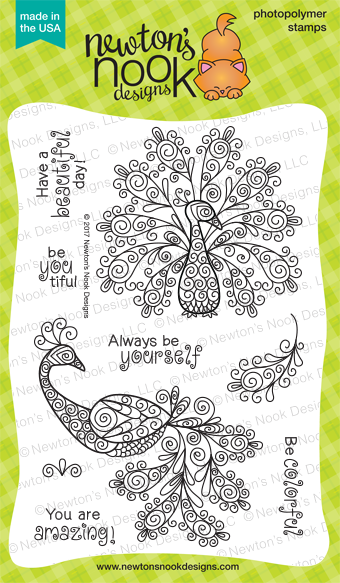 Such a pretty background and I love how you stamped the sentiment - so creative! What a beautiful card. I love the way your background compliments the peacock colors! Love your gorgeous background, Holly! Amazing card!!! I love the pretty colors in your peacock! Beautiful design! What great inspiration here!!! Those there colors look amazing together! Love all that inky goodness! Love this pretty card. This is gorgeous! I love those new inks! Mine are on the way and I can't wait to play! They created such a fun background! Thanks for the gorgeous project today! So pretty! What a fun background to match the peacock. Cute card. I am in love with this new set. I love your blue background and peacock! So beautiful! Awesome colors! Love your beautiful peacock card! Oh wow!!! Love your Peacock card!!! Absolutely gorgeous!!! Lovely card! The watercoloring of the peacock reminds me of stained glass - beautiful! Great card. Love the peacock. Beautiful embossed peacock and I like the colors. Beautiful. I love how you used the same colors on the background, peacock, and sentiment. 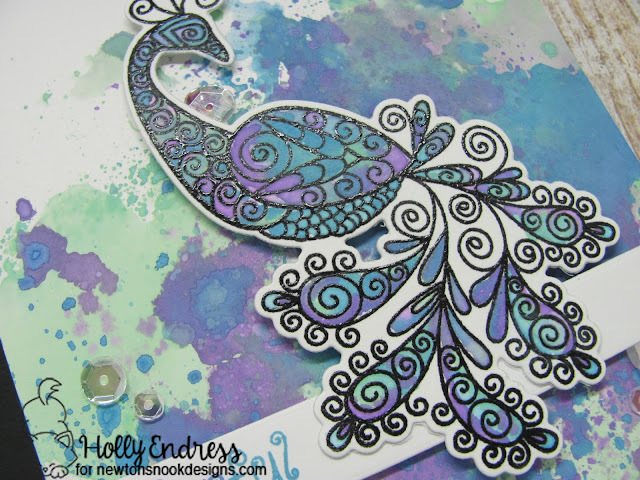 I love that gorgeous color combo and how the peacock looks like stained glass! Wow what a stunning effect you created with these inks and the gorgeous image. Love your background, can't wait to try the oxide inks! Beautiful colors on the peacock, very pretty! Very cute card. Thanks for the inspiration!